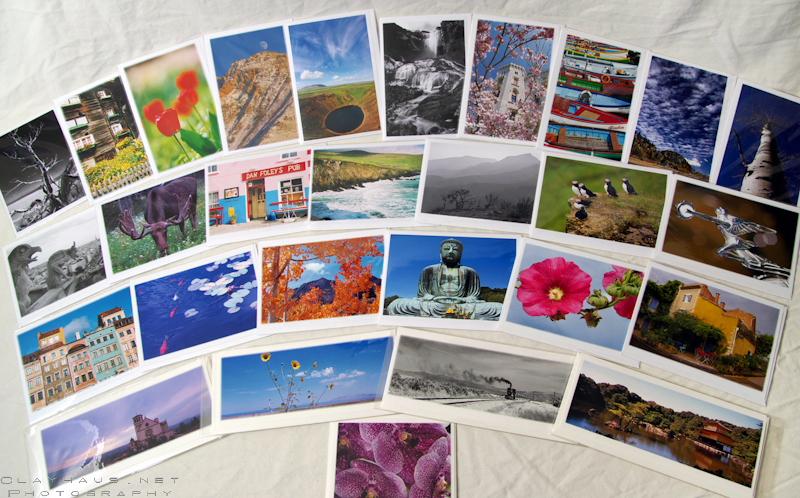 I’ve heard a comment from other photographers that creating photo-cards to sell was not worth their time. They have a point. Though the markup percentage may look good on paper really we are only talking 2 or 3 dollars per sale. Factor in the time to order stock, create the card in Illustrator (or wherever you do that kind of work) and print it out and are you really making that much? Probably not. So why do I still do it? Basically three reasons. The first is pretty obvious: there are days when cards are THE primary salable products. It’s not what you want, but it is what it is. There are other days when I may unload a card or three but matted prints are what’s hot. Go figure, because I can’t. So, cards are the fall-back. They are also very easy to make, once you have a template. I do mine in Illustrator. Replenishing stock is as simple as just opening the file and print. I’m doing it while writing this post. Creating new cards is also pretty simple. With Photoshop, I just create a border effect on the image I want to place in the Illustrator template, drop it in and re-number the card. Done. Finally, cards are a marketing tool. Assuming you have your company and contact info on the back, there are at least two people who will receive the message that you are a talented photographer: the person who buys the card and the person who receives it in the mail. For a buck or two outlay, that’s not bad.